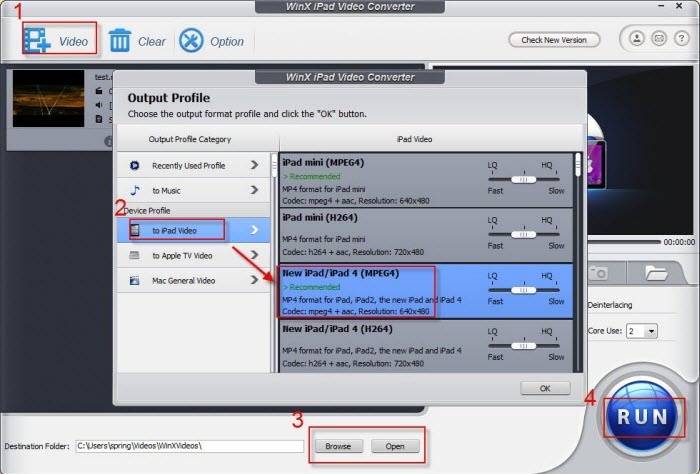 How to convert MKV, MTS, TOD, MOD, AVI, MPEG, WMV to iPad with WinX iPad Video Converter? WinX iPad Video Converter, a professional iPad converting software, designed for helping users convert HD video, camcorder video and regular video to iPad as well as iPad2, iPad3, iPad4, iPad Mini, iPad Air, iPad Mini with Retina Display, iPad Pro, Apple TV (HD). The HD video and camcorder (HD) video formats includes AVCHD, MKV, MTS, M2TS, MKV, MOD, TOD, etc and the regular video formats like: AVI, MPEG, WMV, MP4, FLV, H.264/MPEG-4, DivX, Xvid, MOV, RMVB, VOB, etc. Meanwhile, WinX iPad Video Converter has a simple interface, easy to use, and with Multi-core CPU and Hyper-threading technology added in, this iPad video converter will provide you fast and stable converting process. How to Convert AVI, WMV, MPEG, FLV, AVCHD, MKV, MOD, TOD to iPad4/iPad Air/iPad Mini (New) with WinX iPad Video Converter? Free download WinX iPad Video Converter. Launch the program and import video. You can load video by clicking "+ Video" button. Select the output format as you wish, like iPad4/iPad Air/iPad Mini/Pro (New), Apple TV, Apple TV (HD). Start converting. You can view the conversion progress and are able to cancel the converting process at anytime. Trim video segment by dragging slide bar under video preview window or setting "Start time" and "End time". Merge several videos (even in different formats) to creating a new one. Cut off unwanted area of a video to feature a highlight, or crop video to remove the black bars. Add external AAS/SRT subtitle files from internet and burn it to videos. Adjust the Audio Quality and the Video Quality. Choose "CPU Core Use" to convert video with faster speed. Q: Can I edit video file name for proper display on my iPad 4/iPad Air/iPad Mini/iPad Pro/Apple TV? A: WinX iPad Video Converter has a unique feature to make target video display with proper file name on iPad 4/Air/Mini/Pro/New iPad or Apple TV. To do this, please import source video, and select the output format, and then click "SET TAG" to edit video file name. Q: How to extract background music from video file? A: Import the video file, and select "to Music" button. You will be able to extract the background music as MP3/AAC/AC3 or other music file. Q: How to extract pictures from Video?